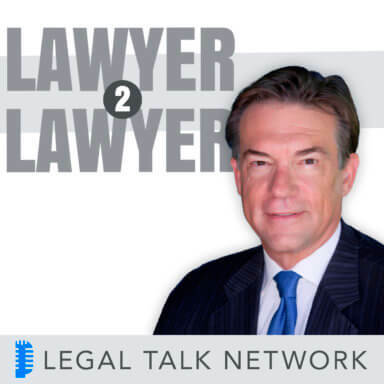 Back in 2005, Legal Talk Network created a weekly show spotlighting current legal topics. That show became Lawyer 2 Lawyer. The masters-that-be plucked two lawyers from obscurity, one from the east, one from the west, turning them into overnight sensations. Back then, podcasting was just starting out and eventually took the world by storm. Fast forward to 2015, and Lawyer 2 Lawyer is still going strong, reaching listeners around the globe. From the debate over the death penalty, to Steve Jobs’ impact on the legal profession, to DOMA and Prop 8 rulings, we have covered a wide range of topics and have enjoyed ourselves in the process. So, today on Lawyer 2 Lawyer, we will visit with an old lawyer friend and musician and get in the holiday spirit, then we will take a look back at 10 years of podcasting with some special guests! ​Lawrence Savell is a New York lawyer, writer, musician, and songwriter. In 2012, after 30 years at Chadbourne & Parke, Larry moved with a number of his colleagues to form the first U.S. office of the international law firm ​Herbert Smith Freehill​s. He continues to concentrate on litigation defense and counseling. Larry’s musical take on the legal world started with performances at the University of Michigan Law School’s “Law Revue” (alleged) talent show in the early 1980s. It continued with solo and in-house band performances at summer and holiday functions at his former law firm, where his poking good-natured fun at lawyers and the legal profession was (thankfully) well received and encouraged. Over the years he recorded many of these songs, producing vinyl records, cassette tapes, and then ‘CDs’ which he gave each holiday season to family, friends, colleagues, clients, and people he met on airplanes. You can find out more about Larry and his music at lawrencesavell.com. Song: Bob’s from Massachusetts so his socks are red. Visions of Lawsites dancing in his head. Craig’s from California, scuba is his sport. Back on land he’s always asking, May It Please the Court. On Legal Talk Network, they’re the host with the most. Just make sure that you don’t pull a lid coast to coast. They’re lawyers who lawyer. Pack ‘em in your pod, they’ll never bore ya. Malibu to Cape Cod. The hottest legal issues and the coolest guests. The most fun you can have while wearing a vest. That’s Lawyer 2 Lawyer. Yeah, yeah, yeah. Craig Williams: Hello and welcome to Lawyer 2 Lawyer on the Legal Talk Network. This is Craig Williams coming to you from Southern California. Bob Ambrogi: Hey Craig, this is Bob Ambrogi coming to from the Legal Talk Network world headquarters here in Denver, Colorado. Craig Williams: You’re at the place where it’s the most fun you can have if you’re wearing a vest. Well, if you caught the theme song at the top of the show, it can only mean one thing: It’s time for our anniversary show. Bob Ambrogi: That’s right, Craig, this is our 10th anniversary of being on the air, or at least on the interwebs. And it’s actually a few months past our anniversary but that’s okay. Before all the fun begins, why don’t we just take a moment to thank our sponsor? Craig Williams: Agreed, Bob. In addition to thanking Clio for their many years of support, we’d like to congratulate them on their 7 year anniversary of being in business. So again, thank you and congratulations to Clio, an online practice software management for lawyers at www.GoClio.com. Bob Ambrogi: Big thanks to Clio, I just want to add my thing to that. Back in 2005, something called Legal Talk Network – I don’t think it was called Legal Talk Network back then, it might have been – created a weekly show spotlighting current legal topics. That show became Lawyer 2 Lawyer, and the masters that be at the Legal Talk Network plucked two lawyers from total obscurity, one from the East and one from the West and turned us into overnight sensations in the podcasting world. Back in 2005, podcasting was just starting out. We were one of the first ever legal podcasts and eventually took the world by storm. Fast forward to 2015 and Lawyer 2 Lawyer is still going strong reaching listeners around the globe. From the debate over death penalty to Steve Jobs’s impact on the legal profession to the Defensive Marriage Act and Prop 8 rulings, we have covered a wide range of topics and enjoyed ourselves very much in the process. So today on Lawyer 2 Lawyer, we’re going to celebrate our anniversary by visiting with an old friend and a musician and a regular guest over the years to our show and celebrate our anniversary and also get in the holiday spirit; and also look at ten years of podcasting, so a lot to do. Craig Williams: ​Bob, our guest today is Lawrence Savell. Larry is is a New York lawyer, writer, musician, and songwriter; in fact, he’s a returning guest, many times over. In 2012, after 30 years at Chadbourne & Parke, Larry moved with a number of his colleagues to form the first U.S. office of the international law firm ​Herbert Smith Freehills and he continues to concentrate on litigation defense and counseling. Larry’s musical take on the legal world started with performances at the University of Michigan Law School’s Law Review; supposedly alleged talent show in the early 1980’s. He continued with solo and in-house band performances at Summer and holiday functions at his former law firm where poking good-natured fun at lawyers and the legal profession was (thankfully) well received and encouraged. Over the years he recorded many of these songs, producing vinyl records, cassette tapes, and then ‘CDs’ which he gave each holiday season to family, friends, colleagues, clients, and people he met on airplanes. In fact, Bob, I’m pretty confident that you and I have several copies. Bob Ambrogi: I think I have an extensive collection of Larry’s CDs. Craig Williams: Alright. You can find out more about Larry and his music at lawrencesavell.com. And welcome back to Lawyer 2 Lawyer, Larry Savell. Lawrence Savell: Thank you very much, I think this is my fifth appearance on the show and I’m very happy that a late surge in the polls got me off the kids table. Lawrence Savell: You guys inspired me. Bob Ambrogi: -and they didn’t want to give it to them, I don’t know how that works. Lawrence Savell: That was for you guys, I’m it’s always been a thrill to be on your show and I’m very excited to be here again. Congratulations on ten wonderful years and we hope for at least ten more. Bob Ambrogi: So, Larry, it’s actually been a while now since you’ve been on the show and we’ve had a new listener or two since then. So I thought maybe you can just recap for us a little bit how you got into this whole music thing as a side light to practicing law. Lawrence Savell: As Craig mentioned, it started in law school when we’d get up at the talent shows at the University of Michigan Law School and then I went to work at Chadbourne and my first year at the holiday party – and this was obviously before I had a mortgage. I got up there and I did a bunch of songs that were well received and over the years I would perform at various functions. Eventually, people said, “Why don’t you record these?” And in 1998, I released my first CD, which was called the Lawyers Holiday Humor Album. And as Law Tunes, I released 6 albums. And then more recently, I switched from Law Tunes to the Surf Chords, which is another imaginary band which exists only in my head. And we released an album called CSUN Greetings, which the hallmark of which is the artwork on the jacket which was done by my 84 year old mother. Craig WIlliams: So is that your latest album, Larry? Lawrence Savell: It is, it is, and she and I are both waiting for our Grammys. Craig WIlliams: Well, the nominations are out so we’ll have to read thoroughly all the way to the bottom and see if there’s a humor category. Bob Ambrogi: We have a clip to play from CSUN Greetings, right? Lawrence Savell: I hope so. Bob Ambrogi: You hope so? Can we play that right now? Song: CSUN greetings. Everybody wants a toy. CSUN greetings. Man or woman, girl or boy. Even where there is no snow, Santa will arrive, you know. Bob Ambrogi: Brian Wilson is very jealous right now. Craig WIlliams: Just to let our listeners know, that album can be found at SurfChords.com. Lawrence Savell: Well thank you, and one of the reasons why I’ve been doing these things over the years is in small part, people have a view of lawyers as stuffy and humorless, and there certainly are some that are that way. But if even a little bit, this kind of an undertaking can maybe change some people’s view of lawyers as being a lot more approachable than they may have thought they were. Maybe when it comes time that they actually need a lawyer, they might be a little more willing to approach them. So I tried a little bit in my own little way to soften the image of lawyers, so it’s been a labor of love; it’s been a lot of fun. The Law Team song talked about all the things we did as lawyers, reviewing rooms full of documents, things like that. And with this latest album, what I’ve tried to do is appeal to a larger audience doing more broader songs. But again, they’re all done by a lawyer which is a little bit unusual and hopefully will have some affect on people. Craig WIlliams: So how do people outside the legal community respond to your work, Larry? Lawrence Savell: Well, I’ve always been very pleased by the response to this. I know a lot of the people who buy the albums use them as coasters, but I think there are some that actually do play them. And I think it’s been very positive. People seem to be intrigued by it. I speak at junior high and high schools every year and I often give out copies to some of the kids there. And the test to me is whether in 24 hours they’re on eBay, and usually they’re not. Bob Ambrogi: As I recall, you’ve had quite an elaborate home recording setup. What’s the current state of your technology and audio equipment? Bob Ambrogi: You should see what we’re using. Craig WIlliams: Well, let’s take another track from your 16 song album; I believe it’s called Christmas Girl that we’ve got a clip from. Let’s see how minimally competent you really are. Craig Williams: Larry, that song sounds like it’s got some significance to you. Lawrence Savell: Well, it does. It does. A lot of things that people create have bases in their lives, and that actually was a song I had written to my wife who passed away. But this album tries to have very upbeat songs and some introspective songs. And you mentioned Brian Williams, he’s obviously the person I’m trying in a small weight to emulate. And what I like about him is he could do the best rock and roll songs and he can do the most personal and introspective songs in my room. I viewed this as an opportunity to try to do both rock and roll stuff but also do things that are trying to convey a message and sentimance and stuff like that and people have really responded to it. And I think a lot of people who know me and who’ve heard this album know what I’m talking about on the album. So when you’re talking about what’s people’s reactions, that’s been the most satisfying thing is that people can understand that there’s a bunch of messages on this record and they seem to be getting it, which is great. One of the songs on the album is Cruising Christmas Eve, which was my try to take on Little Saint Nick, talking about Santa’s sleigh and I list several vehicles that are in Beach Boys songs and stuff like that. So it’s woody, obviously, and it’s cherry because it is, that kind of stuff. The first song on the album, In the Saint Nick of Time, is about somebody who forgot to send their Christmas gift, seeing Santa come down the chimney and saying, “Hey, would you mind delivering this for me?” And in that kind of desperation, it reminds me of when I was a beginning associate running to the West side of Manhattan trying to make a FedEx deadline before they closed the garage on my career. So all of that has meaning and actually at one point I sent a copy of it to one of the big delivery companies to see if they would want to use it in commercials. I didn’t hear back so I’m assuming it was lost in transit. Bob Ambrogi: Well, Larry, we’re really sorry about the loss of your wife and everything that happened; we’re really sorry for that. But on a lighter note, I understand that just this week you had written and produced a new Lawyer 2 Lawyer jingle for us for our 10th anniversary. Do I have that right? Lawrence Savell: You have that right! I was so happy to be invited come back; I was very happy to do this and I hope you’ll like it. Song Intro: One from back East, the other out West bringing you the greatest of guests. And it doesn’t matter whatever you do; whatever the subject, you’ll learn something new. So pull up a chair and prepare to be wowed. Their virtual reality has never a cloud. Two peas and a podcast, Bob and Craig too, bring Lawyer 2 Lawyer to you. Craig Williams: That’s fantastic! Thank you! Lawrence Savell: I’m glad you like it, you’re very welcome. Bob Ambrogi: It’s got a little monster mash thing going on there. Lawrence Savell: It’s such a thrill to be on this show and I’ve enjoyed your broadcast for so long as have many, many other people. And if I can go back a little bit, I wanted to do that so thank you very much. Craig Williams: Well that was quite a present for the end of the year and thank you so much Larry. And I also like Bob want to express my sympathies for you over the loss of your wife. It hit us hard when that happened and we’re glad that you’re back and happy that you’re making new music and thrilled with this latest jingle. This is just fantastic for our 10th anniversary. Lawrence Savell: Well when you invite me back for the 15th, hopefully I can top it. Bob Ambrogi: We’ll be sure to do that, we really appreciate it. We’re getting near the end of this segment. To our listeners, stay tuned because we’ve got more for this show. But Larry, we really appreciate your being with us today. It’s been a real pleasure to talk to you again and to hear some of your latest work. Lawrence Savell: Thank you very much. And again, congratulations on a wonderful show that I’m sure lots of people other than me look forward to listening to every time. Craig Williams: Well, thank you, Larry. And we’re going to take a quick break to hear a message from our sponsors. We’ll be right back. J. Craig Williams: Welcome back to Lawyer 2 Lawyer. I’m Craig Williams and I’m joined by my co host, Bob Ambrogi. In our last segment we were talking with Larry Savell who has just released a new album. You can get it at SurfChords.com, and now we’re going to have two mystery guests and we’ll take a quick look back at the last ten years and somehow cram all of this into 15 minutes. So, I don’t know how to introduce our mystery guests other than to say hello. Michael Hochman: Hello, Bob and Craig. How are you? Bob Ambrogi: We are just great. Michael Hochman: You have no idea who I am, do you? Bob Ambrogi: No, I haven’t heard your voice. I’d have to say I’m stumped. J. Craig Williams: I’m stumped too. Michael Hochman: For probably six years you heard my voice every Wednesday around 1 o’clock. Michael Hochman: How’s it going, Bob? J. Craig Williams: Michael Hochman. Michael Hochman: Hi Craig, how are you? J. Craig Williams: I am fine sir, how are you? How’s that baby of yours? Michael Hochman: Doing great, thank you. Bob Ambrogi: And I know now why I’m stumped because you’re not on good recording equipment. I’m not hearing your good and pure voice. Plus, now that you’re a lawyer it probably corrupted your voice anyway. Michael Hochman: I didn’t have a landline to connect to so we had to use my cell phone. Bob Ambrogi: Listeners, Michael Hochman was the producer of our show for how long did you say? Six years, was it? Michael Hochman: About 6 years I think, yeah, maybe a little more. Bob Ambrogi: Producer and engineer of our show. Kate was the producer of our show and Mike was the engineer of our show for many years and he got so sick of hearing about lawyers every week that he decided to go to law school himself. We tried to talk him out of it. Bob Ambrogi: Yeah. And that was us asking you. So tell us what you’re doing these days. Michael Hochman: I’m working in a small law firm really doing a lot of family and probate type law and I’m liking it. It’s a great way to just get the experience in front of a judge and in a courtroom that I didn’t have before and it’s been fun. But I definitely miss talking to you guys and being a part of Legal Talk Network. J. Craig Williams: So, Michael, is there anything we did that motivated you to become a lawyer or how did you come upon the desire to be a lawyer? Michael Hochman: Really I think it was you guys directly and all of the shows and the different topics we covered. I always said that working with Legal Talk and being a part of your show and a whole bunch of other shows that we did exposed me to a whole bunch of different areas of law that I didn’t know existed and really showed me how the law tied into really every aspect of life. So it was that interest that kind of got me involved with law school and really brought me to where I am. And the funny thing is I say that being a part of the show exposed me to all these different areas of law that I didn’t know existed. And now that I am a lawyer and now that I am working a law office, I’m working the form of law that I was exposed to before I was working with you guys. So it’s funny how it worked out that way. Bob Ambrogi: Well, Mike, of course you know that while you were working with us, you were working with part of a team and Kate, who is our producer, as I’m sure you know Kate has just recently come back to work with our show again so I’m really excited about that. So if the law thing doesn’t work out for you, there’s always a place back here for you on the Lawyer 2 Lawyer show. And the pay is amazing. J. Craig Williams: And the hours are great. Michael Hochman: One of the things that I always joked about, at least with Kate, is that once I’m finally done with law school and I’m finally a lawyer, I want to be able to come on Legal Talk Network and have my own show. I feel as though this is my chance to do that. J. Craig Williams: Well, with using the lousy recording equipment, I’m not sure you’re putting out a good impression as a former engineer. Michael Hochman: I could set something up. I could send you guys a good quality recording afterwards if that’s what you want. J. Craig Williams: Oh yeah, we’ll have to have it taped. We’ll have to do a baby lawyer show. Well, Bob, I think it’s time that we take a break and bring in our second mystery guest if we’re going to finish up in time to end the show. Bob Ambrogi: Well, we’re continuing with our anniversary show here and we’ve already had one mystery guest unknown to us come on the show. Mike Hochman was a longtime former producer of our show. And we have now just been joined by a second mysterious guest. We don’t know who it is, so welcome to the show, mystery guest. Lu Ann Reeb: Thank you, Mr. Ambrogi. Bob Ambrogi: Oh, that’s too easy, I’m sorry. How are you, Lu? Lu Ann Reeb: How did you know, Bob? That’s not fair. Wheres Craig? I could have fooled Craig. J. Craig Williams: I had it too, I had it too. Even though you tried to disguise it, it didn’t work. Lu Ann Reeb: Hey, I just want to know why I’m the number two mystery guest. That’s what I want to know. J. Craig Williams: You’re number one in our hearts, Lu Ann. Lu Ann Reeb: Aw, me too. Back at ya, Craig. How is everybody there? Bob Ambrogi: Everybody’s good. How are you doing? Lu Ann Reeb: I’m doing really well. I’m in Boston, not too far from Bob, as he knows. I’m such a great fan of Lawyer 2 Lawyer for ten years now. How did that happen? I’m not ten years older. I don’t know about you but I’m certainly not ten years older. Bob Ambrogi: So for our listeners who may not know what your connection is to the show, do you want me to tell them? Or do you want to tell them? Why don’t you tell them? Lu Ann Reeb: No, you tell them. I’ll be interested in your tall tale. Bob Ambrogi: You are the brains, you are the founder. You are the creator, Lu, and without you we would not be here. Lu started the Legal Talk Network way back when and Lu and her partner, Scott, cajoled Craig and I. It didn’t take much cajoling, frankly, but got Craig and I together to do our first show, which back then was called Coast to Coast until somebody threatened to sue us over the name and we eventually became Lawyer 2 Lawyer. So Lu ran the company until three years ago? Is that right? Lu Ann Reeb: Right. 2012. Bob Ambrogi: Sold it to the new owners, to LAWgical, the folks who now own Legal Talk Network. She kept us going all those years and was our inspiration and taught us everything we know about broadcasting – which sadly is not much. J. Craig Williams: Well, maybe she taught us a lot, we just didn’t retain it. Bob Ambrogi: Well, we just didn’t retain well, yeah. J. Craig Williams: So, Lu Ann, how did the Legal Talk Network start? Since you and Scott were the ones that started it, how did it come into being? Lu Ann Reeb: Well, it’s a funny story that I tell often to lots of audiences and I teach at Emerson College. I’m head of the Entrepreneurship Program at Emerson College now and I still have Boston Media Group, which is sort of the mothership from which Legal Talk Network was born initially. But how did it get started? So we came from the broadcast industry and started our own business thinking of different ways that we could create programs because we really, really are passive with storytelling and we came up with this crazy idea that lawyers like to talk. And wouldn’t it be great to do programs with lawyers hosting the program but talk about legal news and legal issues. So we ran the idea by some folks and then we said, “How are we going to find these lawyers to do this?” So we turned to the internet and started looking for high profile legal bloggers. Even back in those days, we ran across, right away, Bob Ambrogi and J. Craig Williams. We thought, wow. If they can blog about legal content, they surely can talk about legal content. And we liked the idea of Coast to Coast. You mentioned that that was the first name of your program and we had to change it. But what was funny about that story is when we had that cease and desist letter from an unnamed source, it was great because we had two lawyers on the show so we turned to our hosts and said, “Okay, now what do we do?” We were broadcasters. Anyway, we started the show and just from the very beginning, I look back on the website of Legal Talk Network to see the inauguration show. I listened to the first part of it and boy, was that a flashback. Through all these years, I’ve got to tell you, these two guys, Craig and Bob, it’s a religion for them. And they have been so committed and so dedicated. Because for the audience, they must know it’s not an easy deal to host Lawyer 2 Lawyer. They do a lot of preparation and they’re great at asking guests questions and keeping the conversation flowing. So that really made our job very, very easy. Mike might have had a different story about it being easy, but I can definitely say you guys really made it easy. And pros, I didn’t have to do much coasting at all. Both of you guys took to water like ducks to water – is that how that saying goes? Anyway, you guys were great to work with and always coming up with great ideas. We had a great staff that worked with us and you might be thinking, “So why are you no longer with it?” So we had a funny thing happen on the way to the theatre, to the show. We got a call from the head of LAWgical. One day, out of the blue, Legal Talk Network was now for sale and Adam Camras, the CEO of LAWgical – what a great guy, we’ve become such great friends – said something very ominous. He said, “We’ve been watching Legal Talk Network,” and I thought, “Oh geez, what does that mean?” It kind of sounded like Big Brother and he’s the man, right? So one thing led to another and they decided to acquire it and they had so many more resources to build it to the next level. We were thrilled. I still talk to the LAWgical team and I still work with Mike and Kate who was the original Legal Talk Network team. We’re still friends and colleagues and all is well. And we always worry what happens if Bob or Craig didn’t want to continue the show because they were the flagship show from the beginning of Lawyer 2 Lawyer. We’ve built 15 different legal programs, many of which you can see on Legal Talk Network, and they’ve added more shows. So I’ll shut up now and you guys can ask questions or talk. But it’s really great to say that I was part of working with you. I mean that. Bob Ambrogi: You know that we all feel the same way. We had a great time and it was great working with you guys. As long as we’re throwing names out, I’m sitting here right now with Laurence Colletti who was our producer between Kate. He did a fantastic job picking up after LAWgical took over and he’s now going to be stepping down as our producer as Kate’s coming back into it again. But meanwhile he’s expertly controlling the soundboard here right now as we’re doing all of this. So shoutout to him as well. Lu Ann Reeb: Yeah, absolutely. I met Lawrence. He came to Boston with Adam and we had a nice breakfast downtown, I think it was at the Liberty Hotel. He really has a great passion for Legal Talk Network. How many shows have you guys done now? J. Craig Williams: We’re probably close to 500. Lu Ann Reeb: That’s amazing. Bob Ambrogi: Yeah, it really is. Lu Ann Reeb: And weekly was not anything to do, but we had great guests, too. I think you guys are still continuing that great tradition. Bob Ambrogi: That’s been one of the interesting things is some of the guests we’ve been able to get on over the years. In the early days there were a lot of people who got on the show who had no idea what a podcast was or what they were getting themselves into. And I don’t want to mention any names right now but I can distinctly remember a couple of the early guests who really were just clueless about the fact that they were on a podcast, they just thought they were on a radio talk show somewhere. Now the podcasts are understood and have become more popular. People come on and appreciate the medium and what it’s all about but that’s really changed. Bob Ambrogi: One of the guests that you lured, instrumental in us being able to get on early on was F. Lee Bailey, the noted trial lawyer. To me he had always been iconic in trial Bar and we had done some interviews I think before even our show started. You had gotten to know him and you were able to get him on our show early on. Lu Ann Reeb: Yeah, he was great. Who were some of your noteables, Craig? J. Craig Williams: I still flashback and am amazed that we’ve now had two lawyers that work for the United Nations and the breadth and scope of their work and I think it was perhaps one of – I think Mike Hochman is on the line with you, Lu Ann, and was on our earlier segment and said that just the variety of legal shows that we did motivated him to become a lawyer understanding the rule of law basically winds its way into every aspect of our lives. I think that one of the hardest things that we all struggle with – especially as a result of the mass killings in San Bernardino last week – is how much international law is important and how important the lawyers are that work with you in terms of just the danger that they face. Because being a lawyer you think you go graduate from law school and you’re going to go be a lawyer. You can’t even fathom that there’s any type of danger that’s involved in it, and certainly there is for those folks. They go out and ensure that the rule of law is enforced in areas that have not known the rule of law for the longest time. So those lawyers, the experiences they’ve had and the things they talk about just kind of expand my mind as well into the significance of what we do on a daily basis as lawyers. Lu Ann Reeb: People would always ask us, Craig, you’re absolutely right. People always ask us would you ever run on a show time. We had so many different ideas for shows, even on a weekly basis that we do. Anything from IP law to tech to tort to sports. I even remember we had a singing lawyer on Lawyer 2 Lawyer one time. A lawyer who sang for us! J. Craig Williams: He was on the earlier segment, Larry Savell. He’s back in the earlier segment and he created a new jingle for our tenth anniversary. Lu Ann Reeb: Was he really?! J. Craig Williams: We’ve had prognosticating lawyers. Bob Ambrogi: We’ve had comedian lawyers. J. Craig Williams: And I think the really coolest one I remember is the guy that got a job as a result of being on our podcast because he was out of work at the time. Lu Ann Reeb: I do remember that. J. Craig Williams: Selling furniture. Bob Ambrogi: On our show was an unemployed lawyer and somebody heard him and gave him a job. Lu Ann Reeb: Well, that made it all worthwhile for sure. But you’re right, there’s so many serious issues. And in every serious issue that we face in society today, lawyers are an integral part of it. And while we joke a lot about lawyers – well, maybe you don’t, but we do – it’s very serious stuff. Bob Ambrogi: So, Lu, what’s next in terms of digital media? You’re teaching basic entrepreneurship. Podcasts are getting kind of old now. Lu Ann Reeb: I don’t know if they’re old but they’re certainly critical mass of commonplace where when we started that was not the case. Also, you’ve got to remember that was really about the same time YouTube was starting. Twitter was 2006, so things have really changed, haven’t they in the past? Even 5 years, if you think about it, with regard to technology. So as a result of that, I teach juniors and seniors at Emerson College in Boston and it’s a yearlong entrepreneurship program. So they come in not knowing anything about what it means to be an entrepreneur and they come in and develop an idea. And I will tell you that a lot of the ideas are to develop apps. An app for building communities, for this or that. I have one student developing an app that will help children with autism. All sorts of things like that. What I have found surprising and surprising about, the young students are finding ways to create social value, in other words social entrepreneurships. They don’t just do it just to make money, although we do create a business model to generate revenue and that’s part of it whether it’s for profit or nonprofit. But they’re very socially minded, much like lawyers are; they actually want to have an impact in any small way to solve a problem, however small the problem might be. And I think those make the best entrepreneurs. Bob Ambrogi: I’ve seen something very similar in the legal field. What you’re seeing is some of the most interesting innovation or development in technology is focus on finding ways to deliver legal services more efficiently and affordably to people who otherwise don’t have access to it. That’s another kind of social innovation. Lawyers are becoming programmers and coders and trying to figure out how to use technology to reach populations that are less advantaged and can’t normally afford a lawyer through normal chance. It’s interesting that you say that about what your students are doing that kind of reflects them. Lu Ann Reeb: Probably entrepreneurs and businesses are the ones who are going to solve a lot of these social problems as opposed to politicians. Bob Ambrogi: I’ve got a quick question for Mike I’ve always wanted to ask him, which is – Mike, you still there right? Michael Hochman: I’m still here. Bob Ambrogi: What was the biggest screwup in the background that Craig and I never knew about? Michael Hochman: One definitely comes to mind, there was this one time. The way we used to have this show set up – and I think it’s probably a little different now. But the way we used to have this show set up was we would connect Bob through Skype on a laptop and feed them into the show. We’d connect Craig through a laptop with Skype and feed him into the show and then we’d call all of our guests and we’d have them on regular telephone lines. And one time during the show, I forgot what happened. I think, Bob, you might have been camping or something; but while on the show, your telephone – which is all you had at the time – your cell phone signal just completely died and you went missing for maybe two or three minutes. And while Bob’s cell phone was dead, something happened with Craig’s connection and we lost him for maybe two or three minutes. And during this whole time, the guests are still going on and talking and they were talking to each other and asking each other questions. And probably after about four or five minutes, Kate and I were able to get Bob and Craig back on the show and they just picked up as though nothing had ever happened and the guests never knew what happened and we were all just cracking up in the background because nobody knew that this huge, huge mistake and huge goof occurred. Bob Ambrogi: I remember that now that you mentioned it. J. Craig Williams: Well, it’s fun to hear all these stories and we’re very close to the end of our show, Bob, if not over it. It’s time to wrap up and get your final thoughts so that we can put this thing to bed. Bob Ambrogi: You want my final thoughts? J. Craig Williams: Well, it’s your anniversary as well as it is mine. Bob Ambrogi: We sound like a bickering ten year couple. Lu Ann Reeb: Well, there’s some truth in that, I can say that honestly! Amicable bickering, amicable bickering. Bob Ambrogi: Actually, we were waiting to record earlier. Larry Savell was on the line and Larry said something like, “When you started this podcast ten years ago, did you ever think ten years later you would still be doing this?” And I think all of us were on the phone agreeing that there’s no way in the world we would be doing this ten years later. I think the reason we all keep doing it is because it’s just been an awful lot of fun. I think more fun than any of us – what did Larry’s song say? The most fun you can invest or something like that. It was a lot of fun and I think that this call has made clear that it’s also created a little family that we’re all apart of all around the show. And the family’s been growing as the Legal Talk Network is growing. And as other shows come in and other hosts and other people have gotten involved, they all kind of start to feel like family. We see these people at tradeshows or seminars or whatever and it’s like you have this connection to them even some of them you’ve never even met before. So my closing thought is what a long, strange trip it’s been, but it’s been a great trip and it’s been fun. I’m thankful to Lu for getting this going in the first place and thankful for the LAWgical folks for keeping it going and thankful for all the folks on this call. Craig in particular, for being such great people to work with all of these years. J. Craig Williams: Well, I think I’d agree with you, Bob, on all of those counts. It’s been a fantastic trip, it’s been a very enjoyable one and a learning one along the way. Mike’s comment about that has really driven it home. More than anything else, it’s expanded my horizons in the legal community and taught me a lot that I would have never known, so I’m very, very grateful for it. I’m grateful for Lu and for Adam and Scott and Kate and Mike and Laurence and the folks that make us go. I’m especially thankful for you, Bob, because you’ve been with me through the whole ride and it’s always fun to have you on the other side of the lines. You ask such great questions, so thank you very much. That brings us to the end of our show. Lu Ann Reeb: Thanks for having me on, guys, it was so nice to talk to you! Bob Ambrogi: Thanks to our mystery guests and thanks to Kate who’s listening in the background to all of this. Craig Williams: And most of all, thank you to our listeners and Join us next time with another great legal topic. When you want legal, think Lawyer 2 Lawyer. Advertiser: The views expressed by the participants of this program are their own, and do not represent the views of, nor are they endorsed by, Legal Talk Network, its officers, directors, employees, agents, representatives, shareholders, and subsidiaries. None of the contents should be considered legal advice. As always, consult a lawyer.